Hallie Crawford is a career coach who helps clients change the way they feel about work and create a career path that is an extension of their purpose and passion. Hallie attended Vanderbilt University where she obtained a degree in communications. After receiving her masters in communications at the University of Illinois, she jumped from job to job, searching for a satisfying and fulfilling career. However, instead of finding what she did want to do, Hallie only found what she didn't want to do. She struggled and was frustrated for years before realizing there were other people undoubtedly experiencing the same thing. It was then that she realized what it was she wanted to do: help others who are in a career transition avoid the struggle she had gone through. Hallie's entrepreneurial spirit and her desire to create something from the ground up led her to quit her full time job and start her own business in March 2002. Through coaching, Hallie helps her clients determine what they are really looking for in their careers and then gives them the confidence and assurance to take the steps in order to obtain their dream job. She incorporates principles of the Law of Attraction into her coaching, ("If you think it, you'll create it.") and is a certified coach through the Coaches Training Institute. She is a member of the International Coach Federation, Coachville, and is on the board of the Georgia Coach Association. When she is not helping a client one-on-one, Hallie coaches small groups through virtual teleclasses and regularly holds speaking engagements and career workshops. As a Certified Professional Co-Active Career Coach (CPCC), Hallie offers an array of career coaching products and services including individual career coaching, ebooks, teleclasses, audio recordings, as well as career testing. Hallie lives in Atlanta, Georgia with her husband Frank. When she is not working she loves horseback riding, traveling, and living by the motto, "The greatest risk in life is not taking one." 1. She loves to dance, especially in her Zumba Latin dance aerobics class. Her dream is to be Tina Turner's back-up dancer - just once. 2. She has always wanted to be an undercover spy in a foreign country, and she uses those skills to dig up a person’s true passion. 3. Don't bug Hallie when her favorite show, Grey's Anatomy, is on. It's her one guilty pleasure. If you'd like to learn more about Hallie, check out her personal blog "Big Grin" http://halliecrawford.typepad.com/big_grin/. 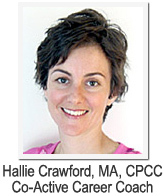 For more information about Hallie’s career coaching, visit her Coaching Style page http://www.halliecrawford.com/coaching-style.html or contact her for a complimentary consultation http://www.halliecrawford.com/contact.html.